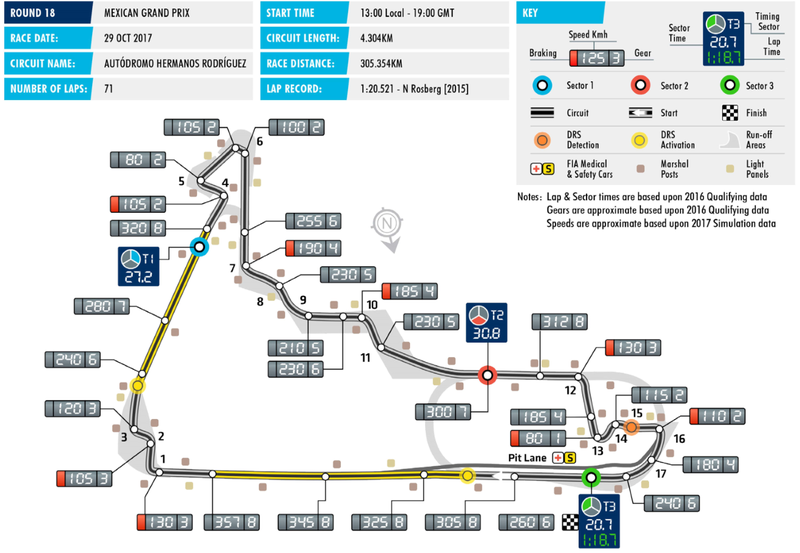 Round 18 of the championship takes us to the dizzy heights of the Autodromo Hermanos Rodriguez - 2250m above sea level a challenge like no other on the calendar. The extreme altitude of the Mexican venue poses several challenges that aren't present elsewhere, putting strain on the drivers, aerodynamic setup and the powerunit. The rarefied atmosphere means that downforce and drag are trimmed by around 20% and so whilst you'd expect teams to be bolting on wings like you'd ordinarily see at Monza, given the long straights that feature, they're actually more likely to have Monaco or Hungary spec parts. The altitude also has large effect on the turbocharger, with the thinner air meaning that the compressor has to spin much faster in order that it supply the engine with the same level of boost the teams and drivers are accustomed to. As a byproduct the energy being recovered by the MGUH (connected to the turbo) can also be affected, limiting energy deployment, relatively speaking, throughout the lap. It's not only the cars that have to breath harder either, with drivers and personnel feeling the effects of altitude on their bodies, something that cannot be overcome easily, as acclimatisation would take around a month. The race comes at a point when everyone is already starting to feel stretched thin too, with a back-to-back set of races in Malaysia and Japan a short rest, timezone adjustment and then another back-to-back from Austin to Mexico - it’s hard work. Think of this challenge when watching the race this weekend, not only considering the exertion from the drivers, who are wrestling cars with more downforce than they've been used to in recent years but also the mechanics who'll push their bodies to deliver the same speedy pit stops we're used to elsewhere on the calendar. 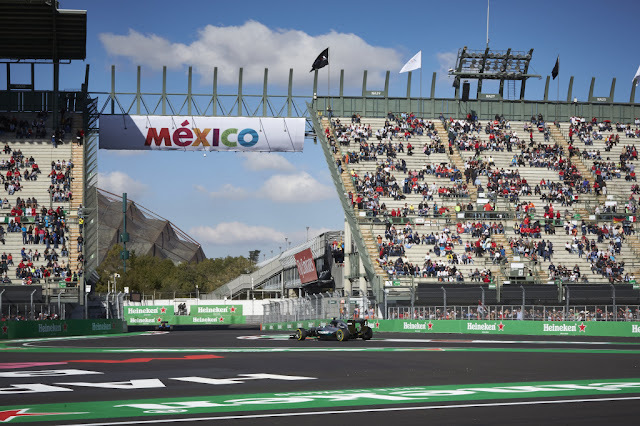 Pirelli have opted for the three softest compounds available to them in Mexico too - Ultra Soft, Super Soft and Soft tyres, with nearly all of the teams limiting the amount of the soft tyres in their allocation as they look to make the other two last as long as possible. It's the first time the ultra soft has featured in Mexico though, as Pirelli continue to be aggressive with their choices. The asphalt laid for F1’s return is still relatively fresh and so it offers a smooth and slippery surface, providing low degradation and edging the teams toward a one stop strategy. The pit lane is the longest on the calendar too, which also has a significant bearing on any decisions made on the pitwall in regard to strategy. There is a 1.5psi delta between the front and rear tyre pressures, with Pirelli offering 21psi at the front and 19.5psi as the minimum pressures to be run by the teams. Meanwhile, the camber limits have been set at -3.50 degrees at the front and -2.00 at the rear. Expect the lap record (1:20.521 Nico Rosberg - 2015) to be smashed this weekend, just as it has at most of the circuits this year and don't rule out a few upsets either, as each team gets to grips with their downforce, drag and powerunit levels - especially those mindful of any penalties they could accrue if they need to take new parts into their allocation (current state of affairs, below). Great summary, I understand the new Mclaren front wing will only be on Alonsos car again so interteam comparisons will be difficult. The new inter team battle with Renault however could get interesing. I was always afraid of races. The noise and the whole dangrous atmosphere do not inspire me to get academic help and waste money on the ticket. I'd rather stay at home. I admire you that you create such great articles. It's nice that you create such good quality posts for us.